We have completed our 5th year of homeschooling. And we have five children. We use KONOS as the spine of our school. I was first drawn to KONOS when I read about it in Diana Waring’s Abundant Life Homeschooling. After I read her review of it and looked at the KONOS web-site, I talked to my husband about it. When it was time to go to our state homeschool bookfair, the KONOS booth was one of my first stops. I talked to the rep, and then I left to walk around the bookfair. That night I spread out all the information I had gathered on my hotel-room bed, and I compared everything I had looked at and written down. I prayed about what God wanted us to use, and I felt that He was leading me to purchase KONOS. I was drawn to two major factors about it. The first was that it is a curriculum based on character traits from the Bible, and the second was that I could use it multi-level. The next day, I went back and purchased the first volume and timeline figures. The only other curriculum decisions I had left was our math program and language arts program. Now that we have used KONOS for the past 4 years, I have to say that my children and I all love using it. We love reading and learning together. And you cannot beat the hands-on learning that takes place. My youngest ones also participate. They love the dramatization and experiments! They can remember so many of the people they have dressed up as and re-enacted scenes from their lives. I am also very blessed to be a part of the KONOS on-line community through yahoo groups. It has such a family atmosphere. We share our joys and our trials. We are able to share and ask questions. My family was privileged to attend the first KONOS Retreat in Oklahoma. It was one of the highlights of our school year this past year. How do you homeschool a houseful of children? And why would you want to homeschool that many children? Wouldn’t it be easier to send them off to school all day? Couldn’t you get more done, if your children weren’t around all the time? You have how many children? Are they are all yours? These are all questions I have encountered since we began our homeschooling journey. I thought my reader would like to read some of my responses to these questions. In doing so, I hope that you are encouraged. Starting with the first question, I will tell you that homeschooling 5 children while pregnant with a dying grandparent to visit every day and three surgeries for two of our children was definitely one of our harder school years. Would I change anything? No. So the “how of homeschooling a houseful” starts with prayer and planning and mercy and grace. I do pray about our homeschool. And I pray that I teach the children exactly what God wants me to teach them. I use the unit study approach for most subjects. And I have picked math curriculum based on each of my children’s different learning styles. When we had a day when we needed to visit my grandmother, we went to see her. When we returned home, we worked on our schoolwork. When a child had to have surgery, I gave all the children the day off from school. We would make up the day later. They have been known to do two days’ worth of work in order to catch back up. I do have a lesson plan. The children know what is is expected each day, and they know that we can adjust it if necessary. This summer, we are focusing on spelling, reading comprehension, and math skills. I know which child needs review in which subject. We are using Spelling Power to bring up our son and daughter’s spelling levels. I have never tried this program before, and we like it. Why would I want to homeschool 5 children (and more, if God sends them to us)? Simply, because God told me that He wanted us to homeschool our children. We take the passages in Deuteronomy and Proverbs very seriously. My husband and I want to train our children for the Lord. We want them to know what the Bible says, and we want to direct their education. We have sent our oldest two children to public school, so we know that parents do not have input into what their children are taught or exposed to in public school. Our relationship as a family is stronger, since we began our journey as a homeschool family. Wouldn’t it be easier to send them off to school all day? No, we have had that experience. And it makes the evenings very busy and chaotic. We also have spent hours getting a child to complete her homework. Would you want to work at your job all day, and then come home to 2 or 3 hours’ worth of additional work? I know some professions do require that of their employee. Usually in those cases, there is compensation for that type of work. It made our child hate learning. There are more time-consuming parts of sending your children off to school. You have to get them transported back and forth each morning and afternoon; you either have to get them to and from the bus or drive them or carpool. And there is the fund-raising, parent-teacher group, the push to volunteer at the school, and many other things that take a lot of your time. Couldn’t you get more done, if your children weren’t around all the time? No. I did not get as much done in the hours that the children were in school compared to what I get done now. The time they were at school, I had to take care of a preschooler, so I only had the few hours that he napped to really get anything done around the house. Now, we have a schedule each day, and the children are responsible for helping out with household tasks. Or they will supervise the younger children while I work on chores. You have how many children? Are they are all yours? In most homeschooling circles, these are not common questions. Normally I get these questions from people when we are out in public. God laid it on our hearts to leave the number of children we have up to Him. And since we have given that area over to Him 8 years ago, He has blessed us with 3 more children and a another one on the way. We also believe that we are married for as long as we are on this earth. I would love to hear any comments about what I have shared today. Another way we have overcome obstacles to our homeschool routine is by having mercy and grace as parents and teachers. There are days when it is just best to put the bookwork aside and spend time building our family relationships. There are days when one or more of the kids is out of sorts, and there are days when the teacher is out of sorts. Those are the days when it is best to take a field trip that we have been putting off. Or it may be a day to spend time baking or doing arts and crafts. Or may be just be a day to stay in our PJ’s and play games all day. Whatever the change in routine, I am being sensitive to their needs and showing mercy and grace on how our schedule goes for that day. If you realize that there are 365 days in a year, and in my state, I only have to have to do “school” 180 days. That leaves me days when we can have mercy and grace with our schedule. Our son, who just had eye surgery, is going to have a week of mercy and grace while he heals. He is not able to read well with the ointment I have to put in his eye four times per day, and he is not yet 7. So I am not tied to counting his school days anyway. I am going to do end-of-grade testing with the older two this coming week, and then the next week, we will all be ready to start back on our regular schedule, Lord willing. Hello, last night as I went to bed I was thinking about this post, and for me, another way to overcome obstacles while homeschooling is to be creative. No, I am not talking arts and crafts creative, though that certainly has its place in our homeschool. I am talking about how to creatively cover the 3R’s when doing actual bookwork will not fit in the schedule on a day when there are lots of obstacles in your way. What constitutes a math lesson? There are many hands-on ways to learn math. One of our favorite ways is to bake. But if we have errands and appointments take us away from the house, we can count things alongside the road. We can review math facts. There are lots of ways to do math without using a book. We also can use math if we need to do some shopping. I am trying to teach my oldest child how to calculate percentages off when an item is on sale. What constitutes a reading lesson? We can read labels on things. We can read road signs. We can play I-Spy with ABC’s. We play license plate BINGO. For my little ones, just singing the ABC song is review for them. The older children can read maps and directions for me while I drive. We can also listen to great literature with books-on-tape. How about writing? The children can help me make a list for shopping and check it off while we gather the items. They can take puzzle books along. The little ones like to take crayons and paper. If we are going to be outside, they can do some nature journaling. The lists are endless. You can truly do a lot of school on days when you just can’t seem to get the books out. I would love some comments with ideas on how you are creative on those busy days. Since the birth of our children, I had to add a new word to my vocabulary—flexibility. This is very important in balancing my day-to-day life and school. Things crop up all the time that interrupt our day, and I have had to learn to accomodate things into our schedule on a moment’s notice. A prime example of this would be something that happened a year and a half ago. I went to take my morning shower while the children got dressed and started chores. They have been told not to interrupt my shower unless I need to take someone to the emergency room. I had no sooner got into the shower when there was a loud banging on the bathroom door. Our then 5-yr-old had jumped from the top bunk onto a double bed and hit the headboard with his mouth. After getting out of the shower very quickly, I decided that he was going to need stitches for the gash in his lower lip. He had cuts inside and outside of his lip. So I dropped everything to take him to our pediatrician. I called my DH to meet me there, and our oldest child watched the other boys while we were gone. The pediatrician said she could not do the sutures, since he had a cut that extended into his lip. So we were referred to a plastic surgeon. We arrived at his office and were wisked into a treatment room. After he was numbed and stitched, we were sent home with a boy with a very fat lip and lots of stitches. I don’t think much school work was done that day, but we worked together as a team to take care of the immediate need. I was flexible with my schedule that day, because I had to be. But there are other days when it is better to visit an ailing grandparent in the morning and come home and do school in the afternoon. And there are days when we do school work very early in the morning, in order to do something later in the day. We have also added two babies to our family since we started homeschooling. And for a time, it was more productive to do school in the evening with Dad home. Does it matter what time of day we sit down to read and write and do math? No, not really. And if we miss a day or two, will it hinder them for the whole year? No. We are being flexible with our school in order to live our lives, and I have not seen any negative repercussions from doing that. Next to my faith in God, my biggest asset would be my supportive husband. When I have had a particularly bad day (and there have been many lately), he is always there to pick me up and encourage me. He helps me see the “big picture.” For us the “big picture” is to raise godly children. That requires godly teaching and training on our parts. Those are the two parts of parenting that take a lot of time and energy. We have seen some fruits of our labor in this area. Our two oldest children will do extra things not asked of them when life is chaotic for me. Most recently, we have dealt with a lot of medical issues. And the two older children have pitched in where needed to get daily and weekly chores done. When I am dealing with a sick child or am sick myself, a lot of what I do around the house is left undone. My older children will pitch in without being asked and do some of my chores. My husband will also come in from a long day at work and cook, if necessary. Having children willing to help when needed falls under character training. We have used the unit study approach to our homeschooling for a variety of reasons, but one of the main reasons was to use our unit studies as a vehicle for character training. Stay tuned. I will have more posts to add to this series in the coming days. I previously posted this 5-part series on my other blog, so I am bringing the posts over here. I hope that it ministers to some of you who might be facing obstacles right now. It seems that our family has been tried and tested quite a bit this past year. And through it all, we have managed to do school, too. We have our year-end testing in two weeks, and I am interested to see if my children have grown as much academically I as think they have in the past year. How have we managed to stay on track with school while overcoming obstacles? The easy answer is our faith in God and His mercy and grace that are shown to us daily. And that trickles down to the grace and mercy we use to operate our homeschool. So stayed tuned to read more. God has given me plenty to write about on the obstacle side of things. If you would like to read more about this, you can click HERE to read about it on my website. This is a reprint of a post I did on my other blog on January 6, 2006. I thought you might enjoy reading it. When our oldest child was in 2nd grade at public school, I read a book by Joni McCoy, called “Living on One Income in a Two Income Society.” She talked about homeschooling her children in this book. I became intrigued at the idea of teaching my children at home. I LOVED being a stay-at-home-mom, and I MISSED my daughter greatly while she was in school. At this time, I also had a two-year-old at home. And I was dreading the time when he would go to school. I thought I would have to get a job outside the home again. Around the same time as I was reading this book CBD (Christian Book Distributors) sent me a catalog with homeschool materials in it. I would sit and look at this catalog every day. I REALLY wanted to do the “Prairie Primer” study. I talked to DH about homeschooling, and we neither one knew a lot about it. So we just kept sending our daughter off to public school year after year. By the time she was in 4th grade, her younger brother started kindergarten. We also had a another son and another one on the way. Our second child made it less than 2 weeks in the public school system, before we took him out to teach him at home. His class at school had too many children in it, mostly boys. And our son was in trouble daily. The breaking point was when he was sent to the assistant principal for a minor infraction. He was scolded until he cried. We decided it was not worth his self-esteem to leave him there, so we took him out. At his age, we did not have to notify our state of this decision. Our daughter was not happy in 4th grade. The homework was overwhelming, and they were using the semester system to teach science and history. And this meant a lot more homework and tests more than once a week. I talked to the teachers and principal about it, and they were unwilling to make any changes. Our daughter asked to be homeschooled, too. So we registered with our state and took her out of public school on her 10th birthday. We have not looked back. I felt like I got my children back, and our daughter tells us that her worst dream is that we would send her back to public school. She is a 9th grader this year, and she is loving high school. We are providing opportunities for her to be with other teens, and we are hosting a monthly dissection class at our house. We have all ages at this class. Last month, they dissected cow eyes. And this month, we did microscope work. Next month, we are dissecting a sheep’s heart. I am also blessed to be serving the homeschool community with our home-based business. It is our goal to honor God with this business while serving homeschoolers. I hope one day someone looks over my catalog day after day and dreams of homeschooling, too. And then I hope they take the next step of faith and decide to homeschool. PS We finally did use the Prairie Primer! Recently, my children and I embarked on a study of our country’s westward expansion. I enlisted the help of a friend of mine, Niki McNeil from Hands of a Child, for a fun way to learn about the Oregon Trail. She provided me with a project pack with the reproducible pages already copied onto color paper called a kit pack. Since I was teaching four boys of various ages and abilities, she sent me pages with “type it in” words on the activity pages for my younger boys. And the copies for the older boys were blank for them to fill in the information themselves. Ms. McNeil also provided me with a teaching guide that provided me with a daily lesson plan for approximately ten days of teaching. It took us closer to two weeks to complete our lapbooks. I am a novice at making lapbooks, and all of the resources that Ms. McNeil provided enabled me to easily create these lapbooks with my boys. I did most of the cutting of the projects due to the fine details of the projects that were provided. My oldest son is 12-years-old, and he could cut his own activities out. My sons, who are 8 and under, needed my assistance with the cutting. 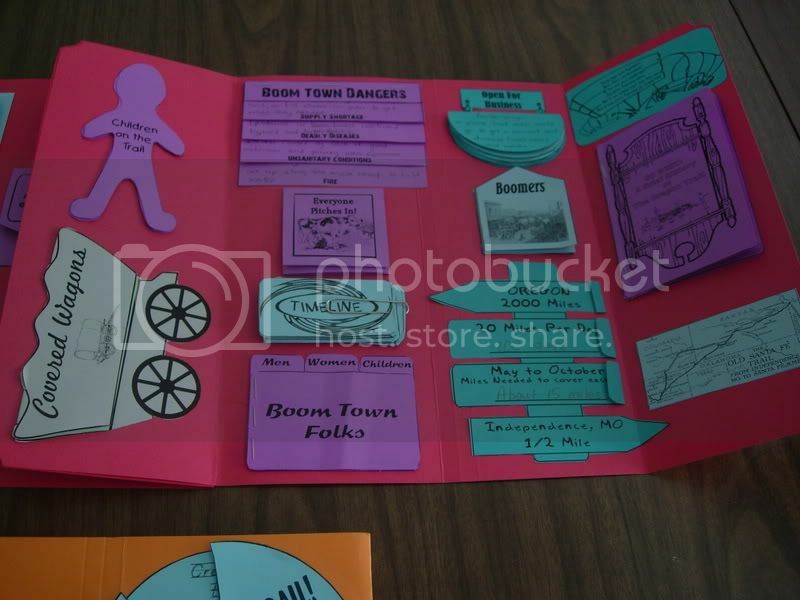 The Oregon Trail Project book also includes the teaching materials for the activities. This made my job so much easier, since I was able to read the section in the teacher’s guide that went along with the daily lessons. Katie Kubesh does most of the research for the project packs for Hands of a Child, and she did an outstanding job on the research for this lapbook. It was informative without being overwhelming. We enjoyed creating lapbooks for the Oregon Trail that I have ordered four more project packs to complete with my children. I would highly recommend any of the project packs or research packs from Hands of a Child for your lapbooking projects. You can even choose to purchase their template pack and create a lapbook on the topic of your choosing. If you would like to see more of the items available from Hands of a Child, please CLICK HERE to visit their website. It was recently upgraded, and I love the new look and new features!